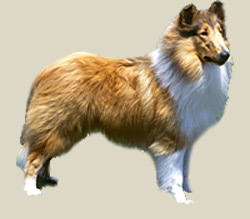 A lovely, active, and agile, long-coated sheepdog made famous by the movie star, Lassie. The lean, blunted, wedge-shaped head gives an impression of lightness. The top of the head is flat. The face is chiseled. The long, smooth, well-rounded, blunt muzzle tapers to a black nose. The ears are 3/4 erect with the tips folding forward. The eyes are almond-shaped and dark except in the case of blue merles that may have blue or merle eyes. The trim, but muscular, body is slightly longer than it is tall. The chest is strong and fairly wide. The tailbone hangs down to the dog"s hocks. In the Rough variety, an abundant double coat forms a mane around the neck and chest. The coat needs regular weekly grooming to look its best. The Smooth variety has a one-inch coat that needs very little grooming. With both varieties the hair on the head and legs is short and smooth. They both come in sable and white, tri-color (black, white & tan), blue merle or predominantly white with sable, tri-color or blue merle markings. The collie is gentle and devoted, a mild-mannered friend to all. It is a dog with a working heritage, and it needs daily mental and physical exercise or it can become frustrated. It is sensitive, intelligent and willing to please, although it is sometimes a bit stubborn. It can nip at heels in play. Some may bark a lot. A good walk or jog on leash or a fun play session is needed every day. Herding is an excellent exercise. The collie can live outdoors in temperate to cool climates, but it is such a family-oriented dog that it is far happier indoors. The coat of the smooth variety needs minimal care; the coat of the rough variety needs brushing or combing every other day, more when shedding. The spectacular stiff coat sheds dirt readily and a thorough weekly brushing will keep it in good condition. Take extra care when the soft dense undercoat is being shed. The Smooth variety has a one-inch coat and should be brushed every one to two weeks.